For the start I created a simple HTML-based test user interface. It shows the avatar scene on a web page without any fancy stuff, just the data. Using the test interface, I can check what exactly happens between client core and display. The client has a 2 tier architecture. There is the back-end, which has all the data structures and does the protocol processing. And there is the front-end, which does all the display, animations and user interaction. The image shows 3 columns. The left column has controls where I can enter/leave web pages by entering their URLs. It also has an input area to request data from the back-end. The center column is a very simple display of the avatar scene. 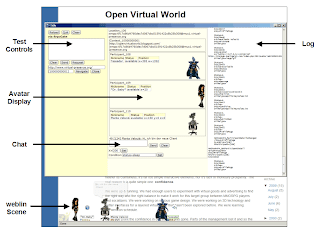 It shows 3 avatars: The same avatars which are shown by weblin (in the lower part of the image). They are compatible! I can chat and move, and even put my avatar to sleep. Everything is still very raw. The right column shows the communication between back-end and front-end. All this is written in HTML. I could write it in C++ or Java, but it would take much longer. The first real display will be in Flash. This shows the flexibility of our 2 tier architecture. Anyone can write a display module like I did in a few days. Maybe someone contributes a specialized displays for power-chatters once we publish the API. what could I say! are above the frontier. August 14, 2009 at 9:45 p.m.
March 3, 2010 at 1:24 p.m.
March 15, 2010 at 6:24 a.m.